Michael Jacobs was haunted by Velazquez’s enigmatic masterpiece Las Meninas from first encountering it in the Prado as a teenager. In Everything is Happening Jacobs searches for the ultimate significance of the painting by following the trails of associations from each individual character in the picture, as well as his own memories of and relationship to this extraordinary work. From Jacobs’ first trip to Spain, to the complex politics of Golden Age Madrid, to his meeting with the man who saved Las Meninas during the Spanish Civil war, via Jacobs’ experiences of the sunless world of the art history academy, Jacobs’ dissolves the barriers between the past and the present, the real and the illusory. Cut short by Jacobs’ death in 2014, and completed with an introduction and coda of great sensitivity and insight by his friend and fellow lover of art, the journalist Ed Vulliamy, this visionary, meditative and often very funny book is a passionate, personal manifesto for the liberation of how we look at painting. Who doesn’t love a mystery? Especially one where the true answer may never be discovered. Author Michael Jacobs died in January 2014 from cancer at the age of 61. Jacobs was the type of Hispanist we all aspire to become. Everything Is Happening was not finished when he passed away and his friend Ed Vulliamy finished this book on his behalf. Everything Is Happening is about the work of the great Diego Velázquez titled Las Meninas (Ladies in Waiting), painted 1656. The painting (see below if you are new) is what was supposed to be the artist painting the King and Queen, and instead they are only reflected in a mirror as the princess and her entourage are seen instead, along with the artist himself. The painting, widely recognised as one of the most analysed of all time with its unique perspectives, was to the author, the greatest piece of art ever painted. Jacobs first travelled from England to Spain 1968 and saw Las Meninas in Madrid first hand. In the dark days of Spain in the late sixties, Goya was one of the collections most often visited, yet Velázquez stole Jacobs’ heart. Nearly fifty years later, it is Las Meninas which has a long queue before it (trust me, I’ve been there twice. To be fair, Goya’s is still massive too). The painting is set in the artist’s studio in the Alcázar Palace in Madrid, to be a portrait of King Philip IV and his wife, Mariana of Austria. The painting instead shows young Infanta (Princess) Margaret Theresa, and her companions – her ladies-in-waiting, chaperone, bodyguards, dwarfs, and dog. Velázquez stands to the left as he paints. It’s long been thought/assumed/theorised that the painting depicts what the King and Queen would have seen, rather than what the artist could see. But this book asks the questions of different perspectives – were the King and Queen ever there at all? Were they in another room, or looking from another angle? Was the artist simply looking in a mirror at himself and those who walked by? 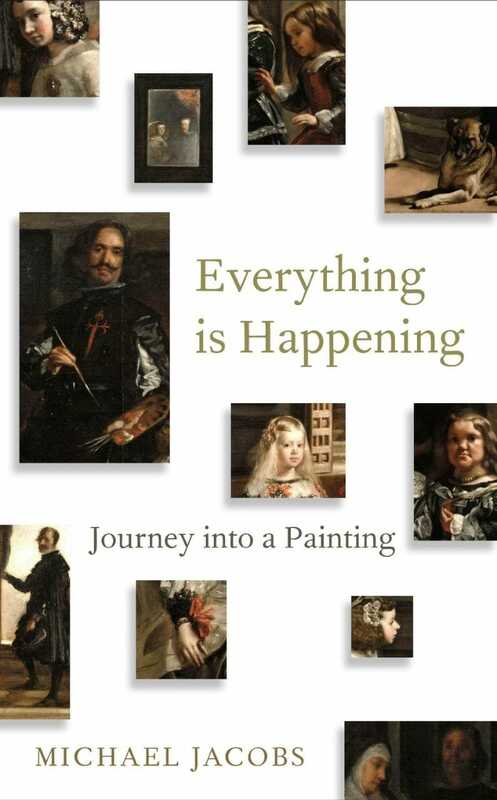 The author of Everything Is Happening doesn’t agree with much of the analysis work done to Las Meninas, suggesting that the constant discussion of the work destroys much of the Velázquez mystery. The French 1966 analysis particularly gets criticism from Jacobs, who is angered by the view that the painting is merely ‘an audience looking a painting while the painter looks at the audience’. But from that opinion climbed to more intense and detailed opinions over the years, thus ruining the mystery. As a different take, Jacobs believed the painting is one that shows realistic children of the age, and of textures and colours that are completely authentic and lifelike. Jacobs himself as about to enter the room where Las Meninas was originally hung when the books stops, his illness drawing this particular search to a close. But Ed Vulliamy, the book’s second author, assumed the book would have met Anthony Blunt, a tutor who taught Jacobs how to read paintings created during the reign of King Philip IV, Velázquez in particular. Indeed, Velázquez never painted a large portrait of the King and Queen, so what painting could they have been posing for, if they were really ever there? The chances that the artist made the monarchs stand for the painting is unlikely, as portraits could be done from quick sketches. The Prado Museum in Madrid opened in 1819 and Las Meninas (which had been named ‘The Family’ previously) went on display in 1843. Ever since, the painting has been known as the greatest portrait ever to come out of Spain, and the artist’s greatest work. While paintings are representing what the artist sees, Las Meninas is seen as representing a representation, an opinion Jacobs didn’t always agree with. The absent yet not-absent monarchs always interested the author, as did the idea that the painting displays both reality and imagination at the same time. The author almost goes in circles, ever quoting “The greatest secret is that there is no secret.” Velázquez was known to have ten mirrors in his studio and liked the use of optics and reflection to aid his work. The author almost chases himself to come up with the many different theories of the painting and the artist, and the God-like image of the King and Queen. Thanks to Vulliamy writing an introduction and an afterword on the book, despite the author’s demise, the book is one where suggestions and realism can work together to tell the story of Las Meninas. No need to be an art lover to understand and enjoy.